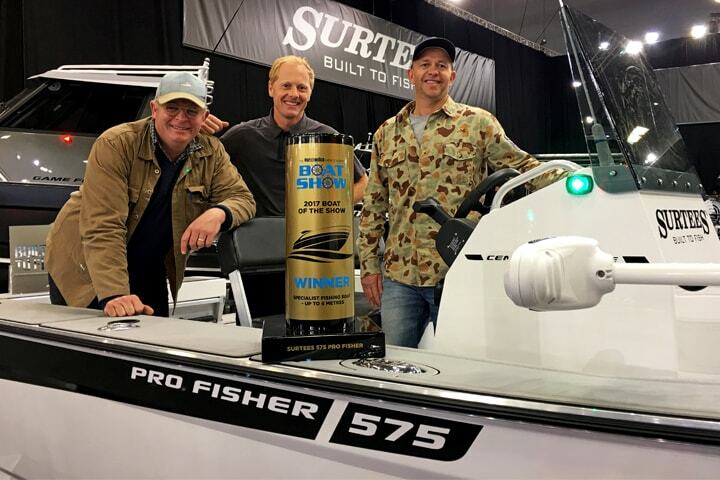 Judges at the 2017 Hutchwilco New Zealand Boat Show have named the 575 Pro Fisher winner of the best ‘Specialist Fishing Boat Up To 6m’ award category. Scoring over 50 points ahead of its nearest competition, the 575 Pro Fisher, belonging to New Zealand Chef Al Brown, didn’t only win the judges over but also gained a huge amount of interest from the public at the show. The 2017 575 Pro Fisher Centre Console has custom features specially made for one of New Zealand’s best-known chef’s and keen fisherman – Al Brown. The name says it all. The Surtees Pro Fisher range opens up a whole new experience for fisho’s that want nothing to get in the way of them and their catch. Surtees Pro Fisher Centre Consoles are serious fishing machines offering 360 degrees of maneuverability and fishing space. This craft was fitted with an optional casting platform and with a low-profile presence, prevents anything getting in the way when Al is casting and hooking up with those big fish. The Surtees 575 Pro Fisher features SiQ technology as standard, including Anti-roll™ Stability Ballast Technology, Life Saver™ Airtight Flotation Compartments, and a 10 year worldwide hull warranty. Al Brown commented ‘For the ultimate fishing platform I couldn’t find better than a Surtees Pro Fisher’.